Attractions like Playa Gandia and Playa La Granadella make great kid-friendly stops. Let the collections at Santa Bárbara Castle and Museo de Arte Contemporáneo de Alicante Maca capture your imagination. Venture out of the city with trips to Cartagena (Roman Theatre Museum & Calle Mayor), la zenia boulevard parking (in Orihuela), Denia Castle and Archaeological Museum (in Denia), Torrevieja (La Mata Beach & Las Salinas de Torrevieja), El Faro de Cabo de Palos (in La Manga del Mar Menor), London Fashion (in Gandia), Playa de la Fossa o Levante (in Calpe), Arenal Beach (in Javea) and Guadalest (Micro-Gigantic Museum & Museo de Saleros y Pimenteros de Guadalest). And it doesn't end there: appreciate the views at Guadalest Valley, take in nature's colorful creations at Palmeral de Elche, make a trip to Explanada de Espana, and get engrossed in the history at MARQ Provincial Archaeological Museum. 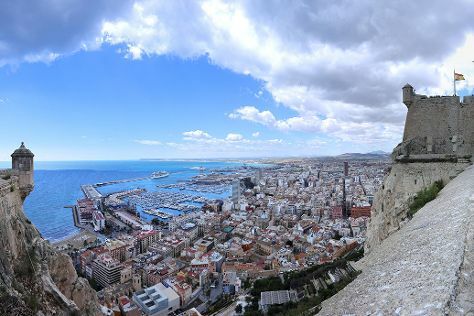 To see more things to do, photos, maps, and other tourist information, read our Alicante trip generator. If you are flying in from Ireland, the closest major airports are Alicante International Airport, San Javier Airport and Valencia Airport. September in Alicante sees daily highs of 34°C and lows of 22°C at night. Finish up your sightseeing early on the 13th (Wed) so you can travel back home.